Mama's Day is just around the corner! I don't know about you but May seems to always sneak upon me. One minute I'm thinking winter is dragging and the next, we're turning the page on the calendar from April to May. If you're struggling to figure out something unique for a Mother's Day gift this year, we have a whole page on the site dedicated to just mom. I'm excited to also say that we've partnered with local florist Colleen of CEP Florals to offer beautiful custom bouquets for locals. Colleen has worked her magic and put together two gorgeous options to choose from - one filled with whites and oranges and one with blues and purples. 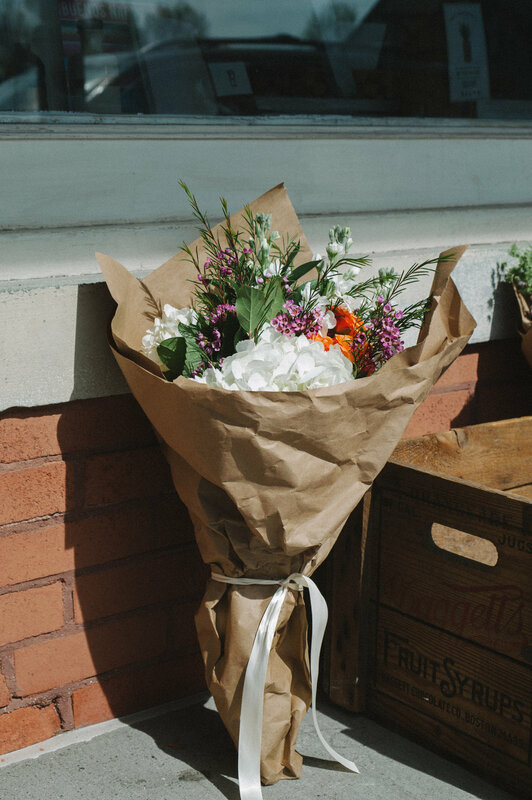 Each bouquet will be freshly made for you to pickup on Mother's Day weekend, wrapped and ready to gift to mom. To reserve your bouquet, stop into the shop or order online here. Orders must be placed before Thursday, May 11. Don't forget to let us know when you would like to pick up your bouquet, either Saturday, May 13 between 9am and 2pm or Sunday, May 14 between 9am and 12pm.